I like to slice my cheese up first and then add to my bread. Butter one side of the bread and lay cheese on the other side. I also created a cheese plate for my party while I was making these since they do not take much time at all! Then spoon the pesto mixture over the cheese. Place another piece of bread on it and fry. Pretty easy to make because most of us know how to make grilled cheese. I let cool before slicing and serving to my guests. Get ready for a flavored packed spin on grilled cheese! I am drooling over this sandwich. I so love that it has walnuts in it. That sandwich looks sooooo good! I love walnuts too, I would never think to put them in with a sandwich! Man! I skipped my last couple of Blue Apron boxes. I am super jealous! This sandwich looks ridiculously amazing! I have never put walnuts in a sandwich before. This looks so delicious and easy to make. I will have to give it a try on the weekend. This looks absolutely amazing! 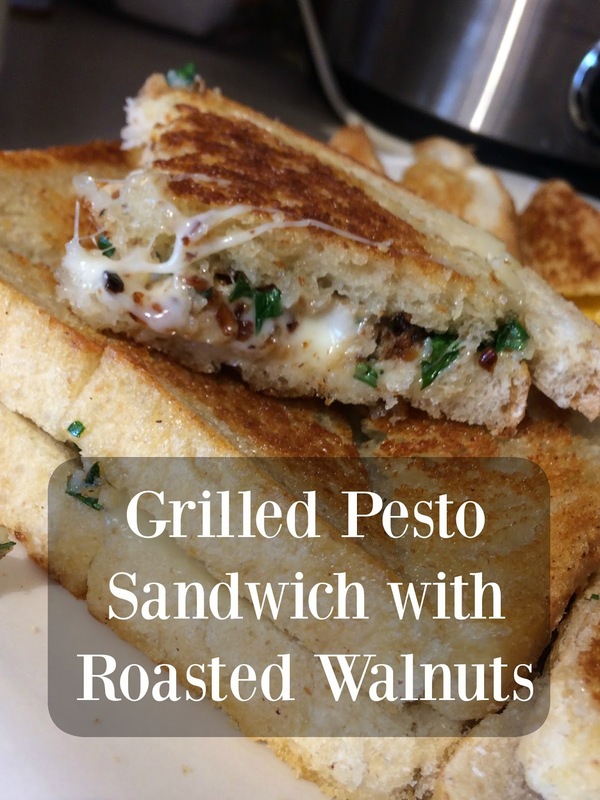 I have never paired the walnuts and pesto together. What a yummy combination. Oh my, this is so yummy! So love this! Hope we can try your recipe soon! This just made my pregnant mouth drool! This will be on my Pinterest board to make in the future! OMGoodness! I am literally drooling! This looks absolutely delicious! Oh my gosh the oozing cheese in the photo makes me want to cook up this recipe!! A definite must try!! These look delectable - I'll have to add in a soy or nut based cheesed and it'll be perfect. The walnuts must add such a nice crunch. This looks so delicious! I would love to try making this at home. Perfect for lunch of a light dinner. This really looks yummy and easy to make recipe. It is perfect for evening snacks with hot tea.